If I had still had little ones at home, I would do this one in minute! I even have a spring loaded bar and shower rings on hand, not being used for anything else. 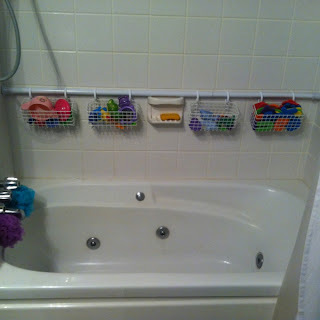 Place a spring-loaded shower rod (Levolor Shower Tension Rod) against the back wall of your tub, with wire baskets (Schulte Large Simple Basket or United Solutions Plastic Storage Baskets) hanging on Shower Curtain Rings to organize all those bath toys. I think any sort of basket would work, either wire or plastic baskets. When company comes over, just move the rod to the top of the shower to get it out of the way. Hmm... I wonder what you could store there if there were no little ones in the house? Reading material? Candles? cleaning supplies? So, who is going to try this one? Tonya DeKruger posted: Awesome idea! Wanda Hurley posted: Very clever. Wish I had known 12 years ago. Stacy Warner Dominguez posted: Love this! Alyssa E Snyder posted: Awesome organizational tool! Tina Taylor Montesano posted: So much better than those plastic Frog Pods that create mold. Great idea! Jennifer Krane posted: Three kids all under four years old - I am so doing this!! Trisha Olsen Sisson posted: I love this!! I've been looking for a solution to all the bathtub toys!! Amber Law posted: OMG!! That is by far the smartest thing I have seen in a while! Pretty sure this is my new to do for my to do list!! Anna Rodriguez Swetman posted: LOVE IT!!! Adrianne A. Henderson posted: This is brilliant! Michelle Atkinson posted: AWESOME Going to have to try it! Jo Hollis posted: This is great.. those Grandbabies will love it!!! Janette Bennett posted: Awesome idea! Barbara Brindley Shelley posted: Would be great for all the different shampoos and body products that keep getting knocked off around the tub. Jawanda - you could do this by adding a couple of big hooks to put the shower bar on. I love this idea and will be using it when I get that far! I have been looking for wire baskets like you have in the picture and can't find them ANYWHERE! Where did you find the baskets like you have in the picture? Thank you for your help! I'm doing this!! I have 2 teenagers and a pre-teen sharing a bathroom. There are so many different bottles in their shower because everyone likes something different. I'm putting this at the top of their shower, so they can reach. And with the shower curtain closed, no one can see it. Glad you enjoyed this idea, but this is not Janene Anderson's idea or photo. This is actually my photo that I uploaded to Pinterest from my kids' bathroom several years ago. I got the BLANKEN wire baskets at Ikea, and we also use a couple of extra shower curtain rings on that rod for hanging up wet swimsuits in the summer now too. The idea itself isn't entirely mine though. I had seen someone using plastic baskets hanging from a rod up high for shampoos and such, but I thought it could be better if it were down low for the kids' toys. It's always fun to see my picture resurface though! 9.8k re-pins from my original post! Wow! Thanks so much for the correction Amanda - I always want to give credit where credit is due! I have updated my post with your info.